Ad Watch Classic: Damsel in Distress, Or? 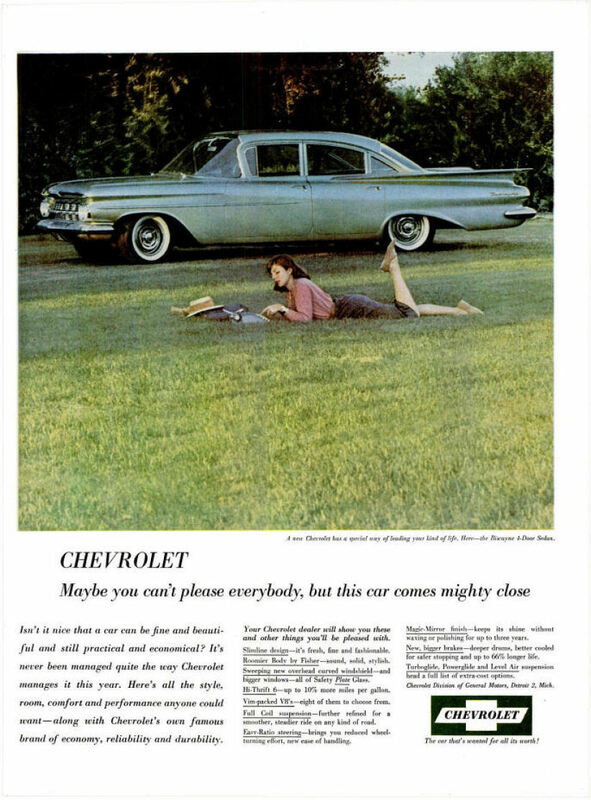 Ah, Chevrolet’s short-lived Rooftop Mannequin option. It was cancelled quickly after multiple reports of the upraised leg breaking off in low-clearance parking garages. I think the car in that movie was a 60 or 61 Caddy. The only car I remember from My Cousin Vinnie was the unibody IRS Tempest. No, it was cancelled because it was killing car sales if the wife was involved in any way, shape or form. I’m wondering about the doofus slumped over the wheel. Perhaps he drove into the river in a stupor and she’s punching through the windshield to save him before the dam bursts. In an unrelated note, the latest season of that series [Supergirl] drops today on Netflix. I think they take out as many Chargers on that show as they did on “Dukes of Hazzard” (Modern police cruisers of course). 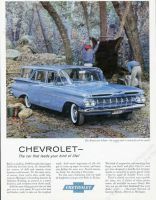 Perhaps they are showing off the 1959 Chevy’s off-roading capabilities. Perhaps this was taken at Schitt’s Creek, and Madame is simply looking for her paddle. They’d do anything to keep us from looking at those bat wing fins. Looks like it was a series of ads, here’s another for a nice Impala hardtop. It appears that the Bel Air owners enjoy driving their car into the river, while the Impala owners prefer driving over the family pet. Hard to say which activity is more expensive. AAAAAAAAHHHHHH get that thing off my beautiful car!!! This photo makes a lot more sense to me if it’s 1969 and the car was parked like that at Woodstock. Hope it’s not saltwater, otherwise the Chevy will find itself in another, less-flattering offroad photo. Send for a tow truck to FISHER it out of the water. Sorry, but I guess I should go. ROFL – nearly sprayed coffee on my keyboard! She’s not even typing correctly — she’s only got one finger on the keyboard. Worst secretary ever! I’m guessing that most potential bosses – who were overwhelmingly male in those days – would overlook any deficient typing skills in her case. Charles Coburn, commenting to Cary Grant as they gaze at a retreating (and very young) Marilyn Monroe, in “Monkey Business”: “Anyone can type”. Car ads seemed to seldom show lower-series cars. 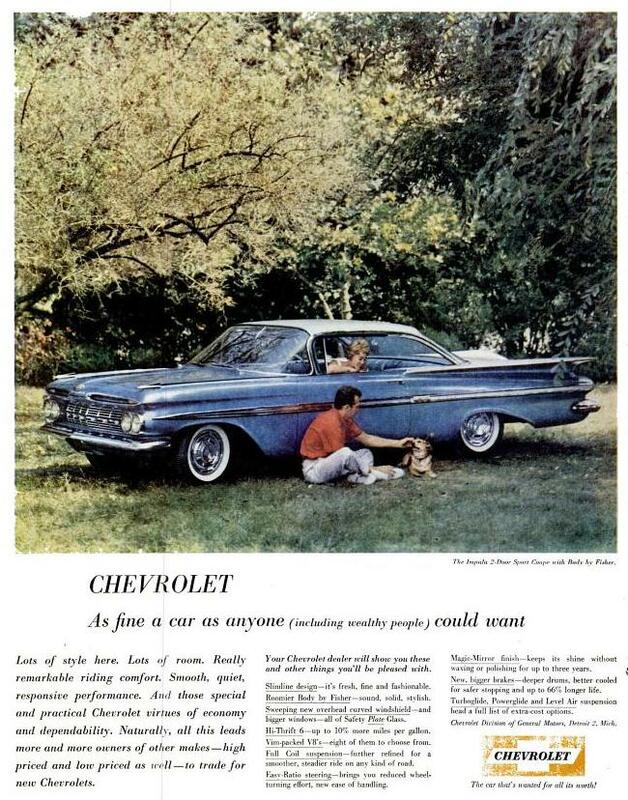 One would have expected an ad to show an Impala, like the hardtop in the comment above, and the price for publishing the ad would have been the same, but a Bel Air (by then the second-line series) and a 2-door sedan at that? 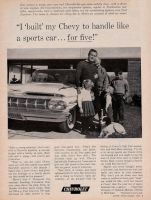 The text in the ad also mentions only the Turbo-Thrift Six engine, as if nobody would want a V8 in a Bel Air 2-door sedan. As one in a series to show the lineup of 1959 Chevrolets, it might make some sense. Maybe the plainer-looking car was meant to not distract from the girl? But then, which were they trying to sell? I take it back. While I was writing the comment, an ad with a Biscayne was posted. That’s the very bottom of the line. Same girl? Still with one leg up, too! But at least this ad includes a mention of Chevrolet’s V8. 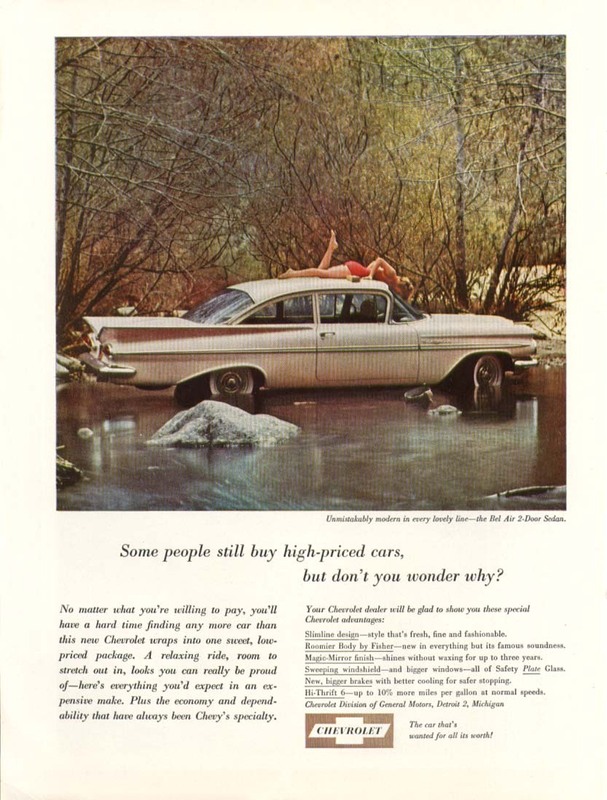 That first ad said, “Why high-priced cars?” I was thinking that the ad meant Mercuries or Chryslers. 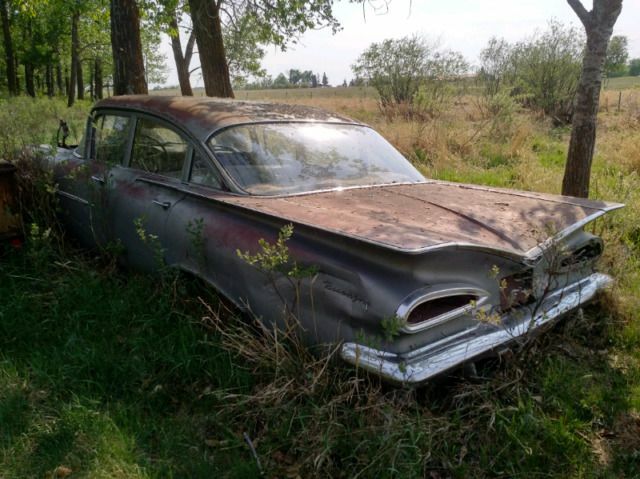 But given the rivalry among GM division then, the targets could have been Pontiacs, Oldsmobiles or even Cadillacs. I guess that in the Bel Air ad, it could even have meant an Impala. And 1959 was still a recession year when Ramblers, Larks and imports were selling briskly. 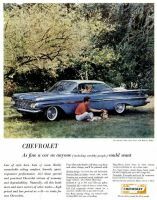 If I recall correctly, in 1959 Chevrolet was selling a fair number of lower-level models, due to the recession, but there were also waiting lists for models equipped with the hot V-8s and manual transmissions. Chevrolet was appealing to both ends of the low-price market. I’ve seen 1959 ads for Impala hardtops and convertibles where the ad copy features the fictional owner talking about how he ordered the car “his way” – with lots of luxury and performance options. The ’59 Corvette was sitting on a two-generation obsolete chassis from ’53, king pins and all. With proper springs and shocks, the Impala may have handled better. The step-down “X” frame also allowed a slightly lower CG. Thank you! That is type of ad I was referring to. I’ve also seen them in old issues of Popular Mechanics online. Well, the girl was unrealistic but the location wasn’t. Back when I had a ’59 Biscayne, a rich friend got his new 4WD Jeepster stuck in a creek. The Chevy pulled it out. ’59s were awful cars in some ways but they could take a remarkable amount of hard use. Some people still buy high-priced cars, but don’t you wonder why, when you can fish a new Chevy out of the river. Just need a scantly clad blonde for bait. I’m not sure Don Draper would approve!! ??? It lacks aspirational desires. Why settle for less when a V8 and automatic is just one step above. Also, Don would have the car parked near the edge of the lake with a reflection in the water. I join others taking interest in the ad featuring low-line cars. Drying out the optional bear skin wagon bed liner? While we didnt go bear hunting, our first wagon for family adventures was almost that identical car, same color even, but the slightly cheaper two door version. It’s amazing how far people will go to avoid paying to park. I guess it seemed like a good idea at the time – today I guess there’d be a disclaimer saying “Professional driver on closed course, do not attempt.” In the 1990s I think I saw a Jeep ad in a similar setting, minus the girl. Well the levy wasn’t dry when she drove her Chevy to it.